It is now some ten years since the Government started to use destitution as a weapon in its efforts to persuade refused asylum seekers to leave this country. It was the shock of this decision and concern at the human misery that it would cause which led to the creation of ASSIST in Sheffield in 2003 in order to provide the necessary local support on a voluntary basis. This has been a remarkable success. Indignation about destitution was also one of the factors which led in 2007 to the foundation of the South Yorkshire Migration and Asylum Action Group (SYMAAG) to campaign for better treatment for asylum seekers and other migrants. At about the same time, City of Sanctuary was born in Sheffield with the objective of building a culture of hospitality for asylum seekers and refugees. In 2007 Sheffield City Council passed unanimously a resolution designating Sheffield as the UK’s first City of Sanctuary. Since then, City of Sanctuary has spread to 24 other towns and cities, with a further dozen groups in formation. These are but part of an extensive network of asylum support charities and campaigning organisations which has emerged all over the country. More than fifty of these organisations are affiliated to ‘Still Human Still Here’ Coalition, together with the Anglican Archbishops’ Council, the Catholic Bishops Conference and other important faith bodies. This coalition campaigns specifically for an end to asylum destitution and the removal of most of the restrictions on asylum seekers working. It is depressing that, despite ten years of effort, asylum destitution remains in place in Government policy and legislation. Unfortunately, politicians seem reluctant to listen to the knowledge and experience of those who actually know asylum seekers and are directly involved in supporting them. Instead, politicians are excessively influenced by the prejudices and misinformation aired daily in parts of the media. But the campaigning efforts will continue. It was recently decided to keep Still Human Still Here in existence as a campaigning body. Recently, a new form of protest about asylum destitution has come onto the scene, reflecting the sense of outrage of city councils that there should be Government policies which actually create destitution on city streets. This began in Glasgow, where in June 2012 the City Council overwhelmingly passed a resolution condemning the UK Border Agency’s policy of forcing people seeking asylum into destitution. Then in January 2013 Bristol City Council passed a similar motion. This development led the asylum organisations based in Sheffield – ASSIST, City of Sanctuary and SYMAAG – together with the faith leaders group, including the Anglican and Catholic Bishops and Muslim leaders, to urge Councillors in Sheffield to pass a similar resolution. 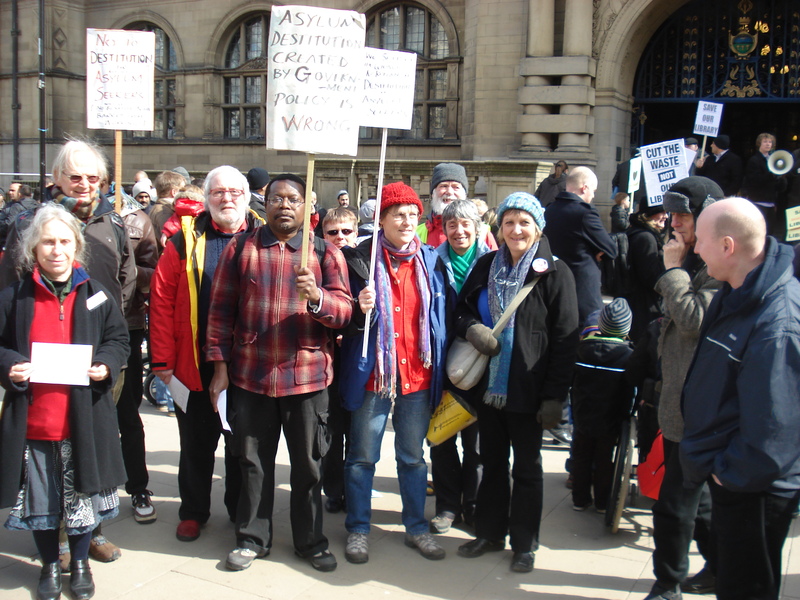 On 3 April 2013 Sheffield Councillors voted unanimously to support a motion condemning the prevalence of destitution amongst people who have claimed asylum in the city. The resolution, proposed by Labour Cabinet member Councillor Geoff Smith and seconded by Councillor Sylvia Anginotti for the Liberal Democrats asks the Leader of the Council to write to the Home Secretary to express concern about asylum destitution and to call for changes in the current system. Representatives from asylum supporting groups (pictured) lobbied Councillors as they went in to the meeting. The full text of the resolution is below. We hope that this protest movement will now spread to many towns and cities across the country. This is certainly the objective of the coalition Still Human Still Here. Such a movement among our towns and cities will show Government Ministers that there is a substantial groundswell of opinion in favour of bringing to an end the damaging (and totally ineffective) policies that cause destitution among asylum seekers. 3. The Local Government Association to encourage other councils in the UK to follow Sheffield’s lead. 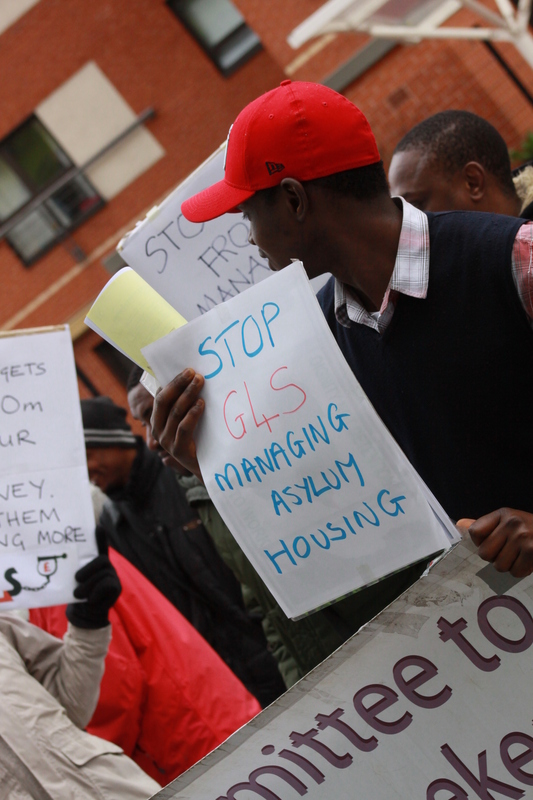 The disastrous COMPASS asylum housing contracts, including the regions contracted to G4S, are being investigated by Home Affairs Committee’s Inquiry into Asylum. Confirmation that “scrutiny of the COMPASS contract will certainly form part of our work” came from the chair of the committee, Keith Vaz in a letter to local MP Paul Blomfield on April 3rd. “Contracts were awarded principally on price without regard to overall best value of the tenders and experience of the tenders”. New Contracts Could Cost More! Also the report points out that despite the disastrous nature of the COMPASS contracts “there is clearly scope for expenditure to rise and even exceed the costs under the old contracts”. It has also been confirmed that a separate Parliamentary investigation into “procurement issues and the performance of companies with large Home Office contracts” will take place later this year, again confirmed by Keith Vaz MP. SYMAAG has submitted detailed evidence about the chaos and squalor that is the G4S asylum housing contract in our region. We have supported asylum seekers when they have given evidence to Parliamentary committees and legal and campaign support when UKBA and G4S have victimised them for speaking out. We say, as we did at the start of the COMPASS contracts, that G4S are prison guards not landlords. Their record is one of abuse towards asylum seekers in this country and elsewhere. We should not be paying them public money to operate this contract. The Home Affairs Select Committee should, if it does its job properly, recommend that the G4S asylum housing contracts (and the Serco and Clearel contracts in other areas) be cancelled and transferred to properly funded not-for-profit providers in the public and voluntary housing sectors. SYMAAG is part of the Stop G4S Campaign, Stop G4S is a coalition of activists and human rights groups dedicated to opposing G4S and working with others to Stop G4S from taking over our public services for private profit while violating human rights.